The Emory golf team brings home the 2016 University Athletic Association championship following its win over the University of Rochester in the finals on Sunday, March 13. It was a big weekend for Emory sports, with the Eagles golf and softball teams clinching University Athletic Association (UAA) championships, Emory baseball placing second in the UAA, and Emory basketball competing in the Sweet Sixteen in the NCAA Division III tournament. The weekend also saw key wins for the men's tennis team and Emory track & field athletes. The excitement continues this week when the women's and men's swimming and diving teams compete March 16-19 in the NCAA Division III championships. In February, the teams were crowned UAA Team Champions for the 18th consecutive year. The Emory golf team brings home the 2016 UAA championship following its win over the University of Rochester in the finals on Sunday, March 13. The event was played at Redtail Golf Course in Sorrento, Florida. Using a match-play format, Emory posted a 4-2 decision over the Yellowjackets. 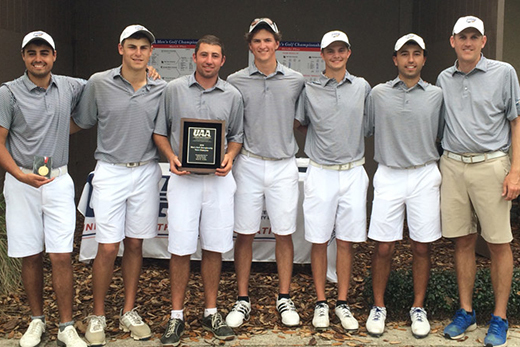 It is Emory's second straight and 16th UAA golf championship over the past 28 seasons. The No. 4-ranked Emory softball team closed out a perfect week at the UAA Championships on Sunday morning, defeating Brandeis University to clinch the championship. Emory softball's 10-0 record at the UAAs marks the fifth time in its 18 years that it went through the league championships with an unblemished record. The Eagles won their 12th straight game and raised their overall record to 21-1 following the 13-5 win. The softball team takes the field again on Wednesday, March 16, when it hosts Pomona-Pitzer in a doubleheader starting at 1:30 p.m. The third-ranked Emory baseball team scored seven runs over the fifth and sixth innings to break open a tie game en route to a 9-3 win over Brandeis University in the final game of the 2016 UAA Baseball Championships in Sanford, Florida. The Eagles ended the week-long conference tournament with a 5-3 record, finishing one game behind UAA Champion Washington University. Emory baseball now faces a three-game series against Covenant this weekend. The team plays at Covenant on Friday, then plays at Emory's Chappell Park on Saturday at 12 p.m. and 3 p.m.
After winning the first two rounds of competition in the NCAA Division III Basketball Tournament, Emory's men's basketball team saw its 2015-16 season come to an end Friday evening as a hot-shooting Augustana College squad posted a win over the Eagles in the Round of 16. The No. 1-ranked Vikings upped their overall record to 29-1 following an 88-65 triumph over No. 25 Emory who closed out the campaign at 20-8. This year marked Emory's third consecutive appearance in the NCAA Tourney's Round of 16. Emory earned an automatic berth in the NCAA tournament after winning the UAA championship. The Emory track & field teams saw three individuals and one relay team earn All-America distinctions at the 2016 NCAA Indoor Championships at Grinnell College in Grinnell, Iowa. On the men's side, senior Maxwell Hoberman and sophomores Max Brown and Daniel Pietsch became the first Emory indoor All-Americans since 2008 and the 12th, 13th and 14th overall in program history. Hoberman earned the All-America honor in the triple jump, Pietsch earned it for the 400m dash and Brown was honored for the one mile run. It was the first All-America honor for each. For the women, the 4x400 relay team comprised of freshmen Dilys Osei and Ariana Newhouse and sophomores Julia Leventhal and Erica Goldman became the second relay team ever to earn All-America status during the indoor season for the women's team in school history. The Emory track & field teams now turn their attention to the outdoor season, which starts this weekend with the Emory Invitational on March 18-19 at the Woodruff PE Center. The No. 1-ranked Emory men's tennis team enjoyed a successful trip to California, coming through with three victories that enabled the Eagles to win the Stag-Hen Invitational. Emory defeated three of the top-11 ranked programs over the weekend, starting with a 6-3 decision over No. 6 Case Western on Friday, followed by a 6-3 triumph over No. 11 Pomona-Pitzer and 7-2 verdict over No. 2 Claremont-Mudd-Scripps on Saturday. The Eagles have won their last eight and post a spring record of 9-2. Emory returns to tennis action on Sunday when it hosts Millsaps over at the SAAC Courts at 11 a.m., before returning to the Woodruff PE Center for a scheduled 2 p.m. match against Centre College.